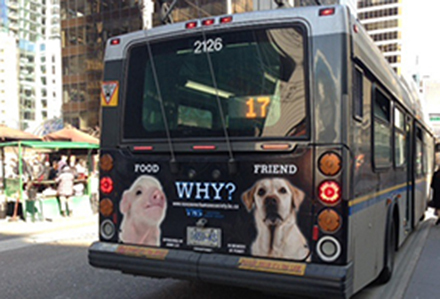 The Vancouver Humane Society's new bus ads question why a dog is a friend when a pig is food. The Vancouver Humane Society wants you to think about puppies before you put pork on your fork. New advertisements gracing the back of city buses place a picture of Fido labeled “friend” beside Wilbur labeled “food” to point out the inconsistencies in peoples’ attitudes toward animals, spokesman Peter Fricker said Tuesday. “We’re certainly moving to putting out a stronger message about switching to a plant-based diet because we think that’s the most compassionate food choice people can make,” Fricker said. With the ads, the society expands its farm animal welfare advocacy beyond its traditional push for people to eat certified organic eggs. It doesn’t expect people to become vegan overnight, but hopes it will inspire people to eat less meat. Despite a Reddit thread that mocks the ads as a suggestion to eat dogs, Fricker said the $6,000 campaign has garnered predominantly positive response and that those in opposition rarely present thoughtful comments. “Nobody argues in any detailed, rational way – they just make bacon jokes,” he said. The Be Vegetarian campaign got so much attention that it raised enough cash to run one thousand of the subway ads at once in fall 2011, according to organizers. The Vancouver ads launched just one week after a Co-op grocery store in beef-loving Calgary made headlines when it voted to phase out the sale of pork and chickens raised in tightly confined spaces. The original article appeared on Metro Vancouver's website.